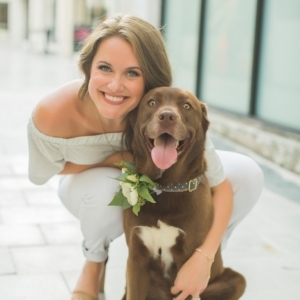 Comprised of 4 ladies and a dog, the PME team is passionate about providing superior service to all of our couples as well as fellow venues and vendors. Established in April 2017, we’ve built a reputation of clear and professional communication and organization ensuring a multitude of flawless wedding days. We can’t wait to meet you! Alexa is a Tampa native and a proud FSU Nole. In her free time, you can catch her with her Husband exploring Tampa, eating good food and enjoying fresh air. She also loves spending time with her 3 furry children: Tucker, Tank and Piper Marie. Aly was born and raised in Tampa and doesn’t have any plans to leave. She’s obsessed with her cat, cop TV shows, vanilla coffee, pineapples and being organized. Her ideal Sunday Funday would be spent on the water with and ice cold beer, good music and good company. Jessica is a recent graduate of The University of South Florida, majoring in Organizational Communication. She enjoys sports (watching, not playing) and supports all Tampa teams. If time and money permit, she is usually travelling somewhere new. She loves hammocks, fruity sangria, and trying to rollerblade. Nikki’s photo and bio are coming soon! Piper Marie is a sassy Lab/Husky mix rescued from a kill shelter outside of Savannah, GA. She loves her Dad, bananas, kids and meeting new friends.